Riverview Theater will be bustling with nicely-dressed people and a spirit of benevolence akin to that produced by Vedic soma will issue forth from the assembled throng. That's how I see the opening of the Shreveport Symphony's 60th season. May I offer that the orchestra, composed of highly-skilled adult performers working like priests to mesmerize us, is a gift more precious than ever in this shnoggy era? Tickets to the season upon us, called Symphonic Fusion because music director Michael Butterman is too alive and electric to be contained by one format, are cheap for the value. and your family to be healed by the power of the Shreveport Symphony Orchestra. Call 227-8863 for your ducats before the salad arrives, is what I say. Personally, I like the package called Anytime Tickets. It is an enormously smart deal, you'll see at the web site. The particulars? One well-planned concert after another from the tight but effervescent team at the SSO. Mozart's Overture to The Marriage of Figaro was the first piece performed at the premiere Shreveport Symphony concert in November of 1948, says Scott Green. The SSO will begin its 60th season celebration with the same selection. Nena Plant Wideman performed on that historic evening, and in her honor, Yoonjung Han, winner of the 2006 Wideman competition, will join the Symphony to perform Listz's Piano Concerto No. 1. Tchaikovsky's Capriccio Italien, also perfomed at the inaugural concert, will round out the season opener. See you there, near the very front of the seating in the Riverview, the better to ritually bathe in the holy music. "I've worked as a seamstress for movie productions for some time now," says Jane Ryder. "Among my work has been the gowns worn by actress Megan Brown for the premieres of the Kevin Costner movie Mr Brooks. When I began to collect the names of local artists and craftsmen for a shop to be called Designers Consortium, someone said 'Jane, you should put together an entire movie crew.'" Thus we watch the evolution of the ancillary pieces of the movie production puzzle. 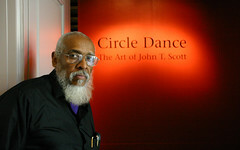 Willard Cooper, artist and a professor of art at Centenary College for some 30 years, is dead. Cooper died of pneumonia in Costa Rica on Aug 28, said daughter Arden Rembert Brink. Surviving Cooper is his wife, Phyllis Cooper, and progeny. Among the artists who developed under Cooper's professorship were watercolorist William McNamara of Ponca, Ar, and Centenary art department head Bruce Allen. Willard and Phyllis attended art exhibits and concerts in Shreveport for some 40 years, and entertained art appreciators at their vine-covered house in Broadmoor. Willard was tall, lean and witty. He used his joie de vivre to keep the art scene from pretentiousness. He was preceded in death by his artist son, David. In recent years Willard and Phyllis were cared for by Arden and David Brinks in Maine, said Bruce Allen. Recently they relocated to Costa Rica. Said his daughter in an email to Allen, "While Daddy's health had begun to decline quite a bit before the move here, he was well enough to enjoy Costa Rica and we're glad of that. The countryside here offers many scenes that are just the sort of thing he loved to sketch and paint, and you could see the artist in him scoping things out, mentally constructing compositions as we drove around and even just right out our front door. We would have loved it if he could have added Costa Rica to his "Maine to Spain" collection. He was never well enough to actually do any work, but I enjoy knowing that he thought about it and perhaps was making sketches in his mind." Of Phyllis, Arden writes, " He and Mom were so devoted to each other that she certainly feels the loss deeply. She is grateful too, though, that he didn't suffer and takes considerable comfort from that. We're glad that she's here with us and even though we've been here less than a year, we've made some dear friends here who will help us make sure that she doesn't feel alone. We continue to hope that people from "our other life" back in the U.S. will come visit us here and I know now, more than ever, she'll enjoy and appreciate that." A Shreveport memorial service will be held in another month or so. 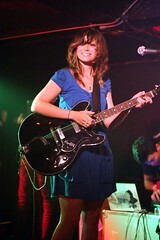 Nicole Atkins & the Sea will be performing Sept 13 & 14 (Thurs & Fri) at Jayne Marie on Cross Lake, says Bruce Flett. 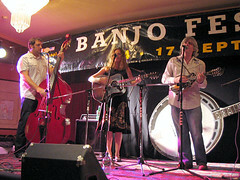 The Bluebirds open the Sept 13 (only) show at 6:30. Nicole comes on at 8. No cover charge for this National artist, points out the frugal Flett. But, he says, reservations would be highly recommended. Tables are reserved for dining customers. Here's what Rolling Stone says about the talented singer. Concludes the value-conscious Flett: "A Rising Star in shreveport in an Intimate setting! Yes!" The artists on display at Centenary College's Turner Art Center are the college drawing and painting teachers as well as staff members at Meadows Museum. It seems they can make fine art themselves. Kathy Brodnax showed a series of funky, sepia chairs as well as painterly landscapes marked by sharp, sure strokes. Fellow teacher Graham Mears, newly returned to Centenary after a number of years in England, presented large canvasses that almost yowled. An agape red-mouthed ape dominated one exhibit area. Another room was watched by a squatamous pug. Mears also had small, droll images of dark hue that were plopped onto large, white fields. Steven Soffer's paintings offered stories made from brighter than bright colors. A child-like simplicity and sense of mystery shone forth. Soffer is also exhibiting sculptural ceramics of organic, columnar shape that I like better than any of his work heretofore. Sculptures by Leia Lewis take viewers 'round the world via boxes festooned with African and Indian imagery. Diane DuFilho, one of the city's leading curators by her vigorous direction of Meadows Museum, has been gardening with pen and ink. Her islands of shrubbery reminded me of the lines of Edward Gorey. DuFilho invites viewers to laugh as well as to admire her competency with pen and yard. One of her hedges is unerringly like a baguette of French bread. 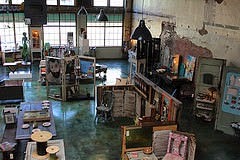 Worth a stop at Turner Art Center, corner of Centenary Blvd and Rutherford? Yes. And there's an adjacent parking lot. By general definition, artists abhor the political realm. Then there are the artists who believe that conscience requires us all to address political issues. 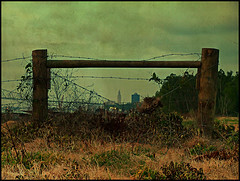 At sptBlog we are artists who believe that politics is an unavoidable part of daily hell. We are civic-minded artists who, ahem, help pay the bills by a state-funded check every now and then. We also believe that the best way to enhance the efforts of Bayou State artists would be to withdraw all political monies from the artists' trough. The indignation and privation would likely bring forth a fiery, celestial burst of artistic energy. But today's lecture is not utopia. It is dystopia, or the governor's race. How to track the candidates without mucking up the soles of our shoes. The best thing I've come across are the candidate interviews being conducted by the Times editorial board and reported at the editor's blog. I thoroughly enjoyed listening to the audio from Bobby Jindal's recent interview. You have a better way to stay informed or develop some insight? USA Today columnist Yolanda Young has been featured on the Oprah Winfrey Show, NPR and Black Entertainment Television (BET), says her web site. 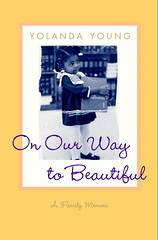 Her memoir, On Our Way to Beautiful (Random House), was lauded in The Washington Post, Chicago Tribune, and Essence Magazine and was her ticket to a life in the media. Young, based in Washington, DC, is one of Shreveport's most celebrated scribes. This weekend in the Washington Post she uses that advantage to profile Hollywood South - It's Shreveport's Season - for the puzzled masses. Young once told stories to an audience at Caddo Magnet High about growing up in the Stoner Hill neighborhood. She entered high school at the time of The Crossover. Stoner Hill kids had been given a chance to go to a neighborhood school or Capt Shreve. She chose Shreve and paid a price in the adjustment. But her most uncomfortable stories were about classmates who defaulted to the less-challenging neighborhood schools. In her lecture she was plainly jubilant that through her successful memoir she was escaping another ghetto: that of being a Washington lawyer. Says The Economist, the pungent British weekly, "Jay Joplng's new London gallery, White Cube Mason's Yard, played host this summer to the year's most talked-about piece of art: “For the Love of God”, by Damien Hirst. A life-size cast of a human skull in platinum, covered by 8,601 almost flawless pavé-set diamonds, “Love” glittered balefully from countless television news bulletins and from the front pages of the world's major newspapers. This was a characteristic Hirst piece: outrageous in its demands (not least a $100m price tag), daring in conception and execution, flamboyantly showy, but as piercingly accurate in its nailing of our thoughts and feelings about life, death, art and money, as one of the pins through one of Mr Hirst's famous butterflies." You like, yes? After a bit of "Rats, I should have done that one before this idiot did it." 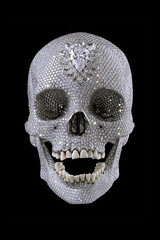 Damien Hirst is easily the world's most interesting artist. The only band in the region that has come to our attention as performers of Leadbelly tunes: The Noids! 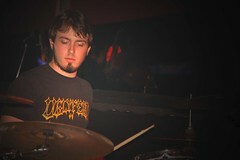 They're fearsome and have one of the best drummers on local turf: Jesse Gabriel. You are invited to the opening of an exhibition of works by the Meadows Museum of Art staff, says Diane DuFilho. The artists: Kathy Brodnax, Diane Dufilho, Neeta Kaji, Leia Lewis, Graham Mears, Steven Soffer. 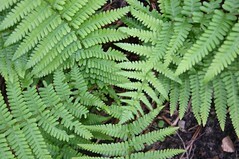 We know that Soffer works in ceramics and other media and that Brodnax and Mears are painters. Otherwise, we are expecting revelations. The show will be in Turner Art Center, across the street from Meadows. John Scott is a lion of New Orleans. Works by Scott from the New Orleans Museum of Art and the Arthur Roger Gallery are on display at Meadows Museum, says Diane DuFilho. DuFilho, director of Meadows, is a New Orleans native and an unusually adept curator for audiences trying to appreciate the Crescent City. Included in this exhibition are eight monumental, black-and-white woodblock prints depicting the neighborhoods of New Orleans, two domestic scale bronze sculptures, and a maquette (small-scale model) of Scott’s public work, New Orleans Spirit House, that withstood the floods and still stands in the De Saix community. The scale model of the New Orleans Spirit House will provide the basis for the Centenary College course Introduction to Community-Based Arts that will be taught in fall 2007. It will also be used in a variety of public programs for the community-at-large. 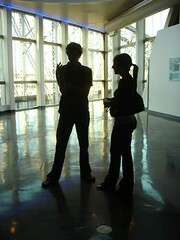 An additional Big Easy exhibit is on display, called City of Hope: Photographs of the Crescent City from 2005 and 2007. 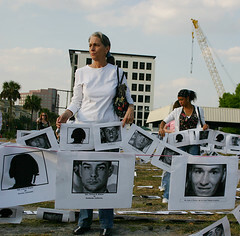 It juxtaposes photographs taken by the staff of The Historic New Orleans Collection just following Hurricane Katrina with approximately one dozen photographs taken during the spring of 2007. - noon to 4 p.m. on Tuesday, Wednesday and Friday. - noon to 5 p.m. on Thursday. - 1 to 4 p.m. on Saturday and Sunday. Hoover Watercolor Society / Karen Harrington's "The look"
"Patricia Mason began perfecting the ancient art of batik as a part of her thesis study, which she completed in 2006," says Freda Powell. The Barnwell Art Center is currently showing 31 of Mason's batik pieces. 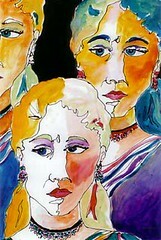 Also exhibiting at the Barnwell Center in the Corridor Gallery is Karen Harrington. 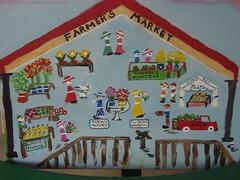 Her work includes batiks and watercolors. Batik is the art of decorating cloth by using wax and dye. A series of batik events will include an all-day workshop on Saturday, September 8 from 9 am to 3 pm. A limited number of gallery walks with discussion and hands-on workshops for high school art students are supported in part by a grant from the Shreveport Regional Arts Council’s Regrant Program, as are school tours of the exhibition. In June, Margaret McNew discovered Sadako and the Thousand Paper Cranes, a book that had been read by her mother, Suzette, and older sister, Audrey. The book tells the story of Sadako Sasaki, a Japanese girl born in 1943. Sadako was diagnosed with a form of Leukemia related to radiation from the atomic bomb dropped on Hiroshima when she was two. She was told of the Japanese legend that anyone folding a thousand paper cranes is granted a wish. Hoping for recovery, she completed 644 before she succumbed to the disease and died at age twelve, writes Eric Gipson of Sciport. Sadako’s courage became inspirational throughout Japan and abroad, with Sadako statues raised in Hiroshima and Seattle. Her story made the paper crane an international symbol of peace. With instructions provided in the book, and with help from her mom, Margaret soon became adept at making her own origami cranes. This turned into a home project to work on cranes to send to the United Nations for the September 21 Day of Peace. 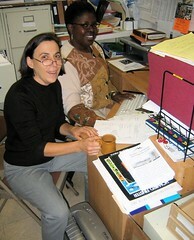 Her school, A.C. Steere Elementary has since become involved, as has sister Audrey’s school, Caddo Middle Magnet. Enthusiasm spread when the McNews contacted Sci-Port Discovery Center for a potential partnership in the project. Crane-making workshop dates were quickly established. Sci-Port’s new President & CEO, Ann Fumarolo, got her former science center, Science North in Fort Wayne, Indiana, to join the effort. 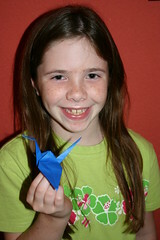 Sci-Port welcomes origami cranes from any individual or group; crane making instructions can be found at www.sciport.org. Cranes can be dropped off or sent to Sci-Port Port Discovery Center, 820 Clyde Fant Parkway, Shreveport, LA 71101, phone (318) 424-3466, toll-free (877) 724-7678. International Day of Peace information is available at www.internationaldayofpeace.org. 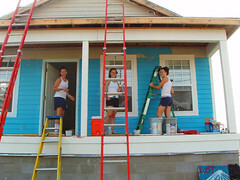 Saturday, September 8, 11 a.m. – 3 p.m.
Sunday, September 9, 2 p.m. – 4 p.m.
Saturday, September 15, 11 a.m. – 3 p.m.
Changing Louisiana through volunteerism and social entrepreneurship is a seminar that was developed by the office of Lt. 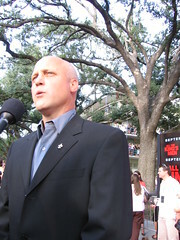 Governor Mitch Landrieu, says the press release. In Shreveport the seminar will unfold on Thurs, Sept 6, at the Shreveport Convention Center, 400 Caddo Street. Registration is Online and Easy, it says. Here's a challenge from sptBlog for those of you who can attend the event: try to find a fellow-attendee to meet you there who's not from your ethnic group. One of the limiting factors of life in Shreveport is a lack of knowledge and awareness across the ethnic divide. If volunteers begin the day with a sense of trust and communication in this problematic area of local life, the seminar will be unusually successful. Topcat@topcatlive.com says of the Poetic Blue Labor Day poetry event being produced by Mocha Blue Blaze, "Make it if you can; wish her luck if you can't. Peace." Yoga devotees Monica Fayad and Kathy Fontaine are leading the planning for a day of peace and yoga on Sun., Sept 23. Events will take place at Lotus Center, 444 Olive St, and Columbia Cafe, corner of Creswell and King's Hwy. It's part of a world-wide day of peace called Global Mala (a mala is a string of 108 beads used in prayer). * 12:30: a gathering at Lotus Center for yoga. Artists are being invited to sketch and photograph the yoga session. * 1:30: the gathering will bicycle or walk to Columbia cafe, corner of Creswell and King's Hwy. * 2:00: water and snacks at Columbia Cafe. Making of luminaria to place on the periphery of the site near nightfall. *3:00: musical concert and dancing. Band(s) to be announced in the near future. 4:00: Sound & Light video / music show of local work. 5:00: more music and dance. The clock struck 11:15 pm as the audience clapped for the cast of Romeo & Juliet at Centenary College's Marjorie Lyons Playhouse on Saturday night. But it was a better production than is implied by the 3-hour length. Nate Wasson and Jessica Maxey, students playing the principal roles, each have a way of touching the audience. Maxey is a radiant 17 year-old. The lights like her. Having seen her in children's theater as well as with the River City Repertory, I can see that she's growing in dramatic fluency as well as beauty. Wasson is a Centenary student who plays Romeo with becoming vulnerability. The supporting players are led by Rob Gilchrist, who plays Juliet's nurse. Early in the play he capably channels the spirit of Church Lady. Watching him wrestle with a role that slides from fun to forlorn is engrossing. Blake Powell presents a strong Friar Lawrence. Cameron Bradford is cutting as Mercutio. In my favorite of his many roles upon local stages, Jim Cowles plays blustery Signor Capulet, father to Juliet. Haley Young plays his wife with cool competence. Destin Bass has the minor role of the Prince of Verona in this play but his voice and stage presence have the vibe of big talent. Don Hooper's spare set design is effective in providing a New Orleans ambience to the play in the opening scenes and an otherworldly air to the bedroom scenes. 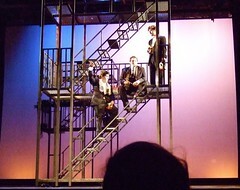 Yet metal towers have loomed in a number of plays at Marjorie Lyons Playhouse. The air of default design is creeping in upon the tall rectangles. The jazz and blues used as incidental music was striking. 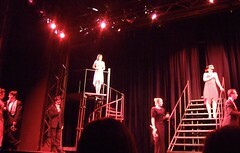 But in the early part of the play the music played in the background as the dialogue unfolded. That music was distinctly distracting and handicapped the actors' lines. 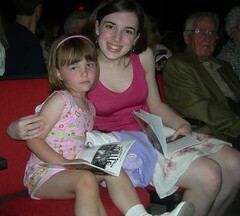 Happily, the background music disappeared later in the play. 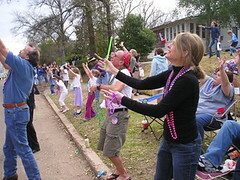 Heather Peak Hooper, director, has not allowed her cast to wear body mics. Hurrah. Because they almost never work as well as intended and because they rob voices of their timbre, I despise the mics so ubiquitous upon the modern stage. Pardon my rant, but if you want to be an actor, build your diaphragm and vocal cords while you develop the expressiveness of your eyes and hands. That said and compliment delivered to the director, I'd recommend you get a seat in one of the front rows. Saturday night there were a lot of young students in the audience, which was good. My 11 year-old son seemed captured by the drama. He gave the production quite a compliment when he noted that, "The bedroom scene; ahem. That was a lot like a James Bond movie." Box office (noon to 4 pm): 869-5242. Please see an earlier post for dates and times. Note that director Hooper is presenting an alternating set of plays; the companion to R & J is an all-female cast that presents The Taming of the Shrew. Where to find jazz in Shreveport is a question frequently found on the lips of knowledgable newcomers. It's Louisiana, right? Where's the jazz? In Shreveport jazz is an evanescent thing. It pops up and disappears as quickly as that. People love to talk about jazz, but supporting it is another thing. At the moment Don Crenshaw, the Man with a Horn, is hosting a jazz jam at the Noble Savage, 417 Texas. He and his pods blow on Thursdays. As Dirty Red he is a local star, sitting in with many a band, recording, inspiring by his very mystique as well as musicianship. Crenshaw and friends know how to burn a roux. They understand that a steady diet of high-flown improv is not a universal draw. So they do the blues and get funky and keep the groove up. The Noble Savage is a perfect place for this jazz-blues experience. Parking is easy and you get to say hello to the statue of Leadbelly across the street. The room, with its brick walls and high, mahogany bar, is remarkably evocative of a classic New Orleans bar. Seating is informal; don't be surprised if there's a reason to chat with people seated around you. Chef Colby's cooking is solid. The variety of beers ready to be quaffed is righteous. Don't hesitate to spy the link to the Noble Savage calendar right here among the sptBlog roster. Romeo and Juliet, as directed by Heather Peak Hooper at Marjorie Lyons Playhouse, runs Aug. 16, 18, 24, 26 and 30 and Sept. 1, with all beginning at 8 p.m. except for the Aug. 26 performance, which is a 2 p.m. matinee. This version of the story takes place in post-Katrina New Orleans. Taming of the Shrew, the additional play being presented in repertory style, will be presented Aug. 17, 19, 23, 25 and 31, all at 8 p.m. except the Aug. 19 performance, which will be held at 2 p.m. The setting for Shrew is 1957. More background: Alex Kent's interviews for the Times. Tickets daily between noon and 4 p.m. Calling it "Part swamp and part soul-stomp," National Public Radio recently did a story on the resuscitation of the 1969 Dale Hawkins album "LA, Memphis & Tyler, Tx." It has been reissued on a British label, Rev-Ola. Writes Tom Moon, "Louisiana-born guitarist, singer and songwriter Dale Hawkins owns one of the most unlikely resumes in rock 'n' roll. He's the author of the swamp-rock classic "Suzy Q," which he recorded for the powerhouse blues label Chess in 1957; it's been covered countless times since, most famously by Creedence Clearwater Revival. After four years at Chess, Hawkins hosted a TV dance party, worked as a DJ and eventually went behind the scenes, landing a job at Bell Records as a producer and talent scout. Among his successes was "The Letter," a massive hit for The Box Tops. Hawkins then went on to work for the rock division of RCA Records, where he shepherded works by Michael Nesmith and Harry Nilsson, among others." Helping Hawkins on this, his second solo album, was " the amazing guitar triumvirate of Ry Cooder, Taj Mahal and James Burton (the guitarist who backed Elvis Presley, Ricky Nelson and others)." The original "Suzy Q," with Burton creating all the guitar licks later used by Creedence, was cut in downtown Shreveport. The Movies & Moonbeams Outdoor Cinema presents a night of high-kicking fun on Friday, August 17, with an outdoor screening of The Karate Kid in Shreveport’s Betty Virginia Park, says John Grindley. Prior to the film, moviegoers will be treated to free ice cream and live music courtesy of SPAR as well as a free youth martial arts demonstration by Philip Tompkins’ Tae-Kwon-Do. Also promised: hot air balloon rides, and more. Movies & Moonbeams Outdoor Cinema is a program of The Robinson Film Center, SPAR, and Shreveport Green. Laura Flett, poet, says, "There will be a spiral laid out on my front lawn...while everyone is having yard sales I'm just offering something a bit more unique." 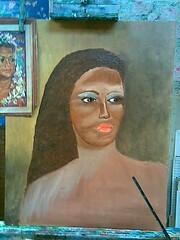 beautiful black woman tercer paso...en proceso. Says Robert Alford, the LSUS Department of Communications will present East Texas Hot Links by Eugene Lee. Remaining auditions are being held Sat, Aug 17 at noon. * Charlesetta Simpkins (mid 20s to mid 40s): Owner/operator of the Top o' the Hill Cafe. A strong, charming woman. * Adolph (early 40s to late 50s): A self-taught sage. A disabled veteran. A nourished spirit. * Boochie Reed (mid 20s to late 30s): A gambler and reader of cards and palms. * Roy Moore (late 20s to late 30s): Love starved, but fancies himself a ladies man. He was a basketball star in high school. * Columbus Frye (mid 30s to mid 50s): A soft spoken, even-keeled, generous man. Own and operates rent houses. * XL Dancer: (mid 20s to late 30s). XL is employed by the Ebert Construction Company working on the new interstate highway being built. A greedy man. * Delmus Green (mid to late 20s): The young blood. Not quite ripe for picking. * Buckshot (late 20s to mid 40s): A man for whom life is simple. Performances are Sept 20 through 23 at 8 p.m. The Bluebirds will be at Jayne Marie's on Cross Lake Fri & Sat, Aug 17 & 18, says Bruce Flett. "Call 318-631-0919 for reservations," he continues, "for Upstairs with the Bluebirds with Miki Honeycutt. We'll play 7 - 11 pm this weekend. It was packed last Fri & Sat, so it is recommended you call ahead! 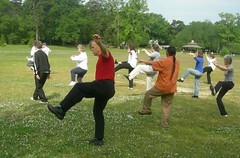 And look in Friday's Preview of the Shreveport Times tomorrow for a picture and writeup." Flett follows his press release with an Elvis story, and if anyone has an authentic Elvis story it would be Flett. "Elvis Aaron Presley died in Memphis August 16, 1977. Do you remember that day and where you were? Most everyone does. That night the Flett Bros Band were playing at the Dart Lounge on Hwy 80 East in Bossier City, La. Throughout the day newscasts were scrambling to find out the "cause of death" of Elvis. Bruce asked the crowd of several people at the Dart Lounge, "Does anyone know how Elvis died? Have they announced that yet?" Our keyboardist, Steve Ramey, said (off mic) to Bruce "Jerry Lee shot him," referring to when Jerry Lee was arrested at the gates of Graceland years before that. Well, that made the band crack up, but the audience did not think it was funny. And, we didn't know Any Elvis songs at the time! We thought we were gonna be tarred and feathered. We came back the next day and learnt several Elvis songs. Before becoming the House Band at the Dart Lounge in 1977, the Flett Brothers Band was the "house band" at the legendary LakeCliff Club on Cross Lake. We remember an advertisement that appeared in the Shreveport Times in 1954, when Elvis first appeared in Shreveport and played an "off night" at the Lake Cliff. We will be honoring The King this weekend at Jayne Marie's by Not doing our infamous unrehearsed "Tribute to the Kings". We love Elvis, and we love Priscilla too. Come and Celebrate Cody Lowery's birthday party this weekend at Jayne Marie's. He'll be 22. Cody will honor the great drummer Max Roach who died today. One of jazz's best and most influential drummers. Cody has a special tribute to him on the song 'West Milam Street'." 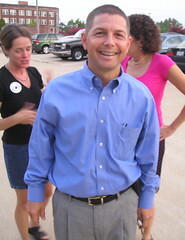 Photo of Lowery by Barbara Beaird. Director Robert Alford, LSUS, has announced the cast that will perform in Lanford Wilson's play, Burn This, opposite Hollywood veteran Taylor Pruitt Vince. The troupe will include Megan Brown, an actress in the Kevin Costner movie Mr Brooks, as well as local actors Ryan Williams and Gordon Christy. The play will take place at LSUS University Theatre Sept 28, 29 & 30 and October 5, 6 & 7 at 8:00 p.m.
Florida native Megan Brown currently resides in Shreveport, according to Alford, though her work takes her to New Orleans (filming The Curious Case of Benjamin Button and teaching workshops) and Hollywood (she will appear in National Lampoon's Robodoc, to be released in 08). 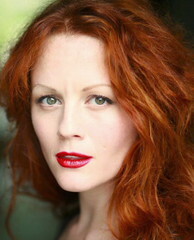 Brown is both a film producer (Persuasion, a short) and stage actress as well as a 2005 graduate of Columbia University. LSUS drama info: 797-5375 or 797-5283. 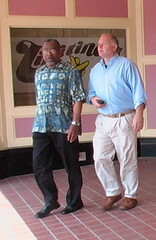 Lt Gov Mitch Landrieu has state revitalization plans that sound pretty good: "In Louisiana, culture means business. To leverage the state's unique heritage and to ensure that it remains the driving force and embodiment of a global cultural economy, the Office of the Lieutenant Governor, together with the Louisiana Department of Culture, Recreation & Tourism, is developing a new initiative, the World Cultural Economic Forum (WCEF), to be unveiled in its demonstration year, August 16-26, 2007." At the Forum he plans to sell Louisiana's best acts to "cultural ambassadors, educators, and arts and cultural leaders from around the world." Landrieu wants to "position the state, along with international colleague nations, as leaders of an emerging cultural economy movement. The program is designed to expand and to highlight cultural events and celebrations worldwide, with hopes of building cooperation and economic development in Louisiana and throughout the world." Is Landrieu simply trying to take a ride on the backs of Bayou State entertainers? Is there any way for him bring artists new offers and open new doors? Certainly I plan to be there to listen to his pitch, 4:30 pm at Artspace. He will take the SRAC Trolley Tour and also stop at Tipitina's Music Co-op, says the press release. But I see the marketplace continuing to be the portal through which Louisiana performers and artists will say hello to the world. Poem of the day for Aug 14, 07, at poems.com is David Havird's "The Horse on Zennor Hill, as published by the Sewanee Review. Havird teaches English at Centenary College and his poetry is widely published: he's been in the New Yorker, Poetry magazine, Southwest Review, Shenandoah and elsewhere. If you remember the late novelist-poet James Dickey and his visit to Shreveport and Centenary College, you'll have a bit of background on Havird. Both hail from South Carolina. And when the lierary Lion, Dickey, said he would visit Shreveport, Havird knew that a vist to Shiloh Baptist Church, near Mooringsport, would be tout le tout. Seems Dickey played guitar. And some of what he knew about Louisiana came from recordings made by Huddie Ledbetter, aka Leadbelly, laid to rest at Shiloh. I've always had a fascination with robots. I blame t.v. and my friends. Mostly my friends. Through the powers of myspace, my friends and I would search for funny robot images and post them on each other's myspace page. Lame, yes, but it got me thinking. It wasn't until January that I needed to fill some sort of artistic void in my life and that is when I started to create these little wooden robots. My background in Art is my family. My grandfather and my mother were painters, and my Aunt Rosemary Davison is a well known local artist in my native Arizona. My family has always encouraged me to explore my artistic needs through life and I have recently broke from my ordinary mold of painting, and ventured to building little wooden robots and painting them to give them personalities. I love Etsy, I've made friends locally (Noma, Pan's Pantry) and nationally, from New York to San Francisco. One of my friends mentioned selling my robots on the indie website and I started selling them in March. Ever since it's been great business. I sell locally more than I do online, but I really don't do it for the money. I make robots to amuse myself and to amuse my friends. I'm trying to venture out into other areas of art, but the robots have developed into a great thing for me. All I need to figure out is what I'm going to do next with these little bots. Two years of music have slipped by at Tipitina's Music Office Co-Op Shreveport, says Dan Garner. The recording and computer facility will celebrate with a visit from Lieutenant Governor Mitch Landrieu on Wed, Aug 15, from 5 pm to 7 pm. Landrieu will also present his World Cultural Economic Forum scheme at Artspace (please see an earlier sptBlog post). Garner, Office Manager for the Shreveport Co-op, will be available for special tours of the facility, including its state-of-the-art studio equipment. Four local bands, Tipitina's members, will be performing an outdoor concert, including Chronic Soul (an R&B band led by Rene Foley), and the Noids (punk folk). To learn more about the contributions that Tipitina's has made to the economic growth of their communities (Shreveport, Alexandria, New Orleans), read the 2007 Economic Impact Study. Mo info: Julia Foley, (318) 402-2398. "A young man in Doyline took on a monumental project to give his little town a face lift. What he has done has been an inspiration to many. Beau Cook, a junior at Doyline High School, took on a summer project that brought more than creative challenges. This young man almost single handedly sought private dollars for a public art venture that has the town buzzing. The unveiling ceremony will be held at 2pm on Sunday, August 19th in front of the old Causey Grocery store in downtown Doyline. The public is invited. 1. A style of painting that gives an illusion of photographic reality. 2. 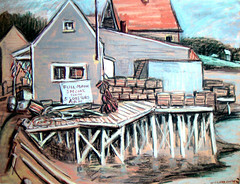 A painting or effect created in this style. 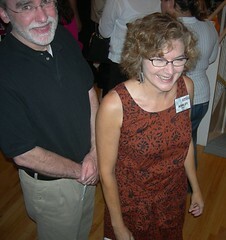 If you liked Theresa Mormino's jewelry at Giftspace in Artspace, you'll be happy to know she has a new shop at Etsy.com. You'll find her under the seller's name of Collageeducation. And if you've tasted Noma Fowler-Sandlin's jellies and jams at the Farmer's Market, you'll be happy to know that you can shop her, too, on Etsy.com. Her shop name is Pan's Pantry. Noma, a multi-disciplinary artist, offers a deluxe web site with quite an array of goodies. Also on Etsy from local sellers: sewn creatures from Donna Strebeck, whose husband, painter Leland Strebeck, has a monster art site called Thine Horsies. And Dia de los Muertos-minded Conchita Iglesias-McElwee is now selling fanciful kids signs as bebedulce. Shopping Etsy is like strolling the planet's Farmer's Market. And there's a clever geolocator tool to guide your peregrinations. "Dirtfoot is an all original, all acoustic band out of Shreveport, LA," says the sextet's myspace page. "Forming in early 2002, they've been honing their songs and craft in bars and pubs across North Louisiana, Southern Arkansas, and east Texas. 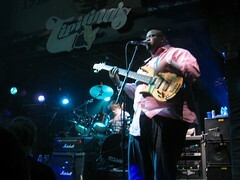 After winning the Shreveport Times Battle of the Bands in January 2006, doors have been opening. Now focusing on festivals and regional events, like Wakarusa Music Festival in Lawrence, KS, Diversafest in Tulsa, OK, Mulberry Mountain Harvest Music Festival in Ozark, AR, Red River Revel in Shreveport, LA, Northgate Music Fetival, College Station, TX, etc, things are definitely looking up." They've got an excellent new album - listen to cuts from it on KSCL, 91.3 FM - and T-shirts and are at a peak of energy. If you like shaking cans of beans to the beat and dancing and watching expressive dancers, this is the hook. Noble Savage? See sptBlog's links, please. In a Wired magazine story entitled, "To Save Themselves, US Newspapers Put Readers to Work," by Jeff Howe (07.24.07), you'll see some of the background to the changes at the Shreveport Times. You'll learn that Gannett editors across the country were sent an unusual package a year ago. Corporate HQ sent new pairs of running shoes to each editor. The message from the Wash, DC, bosses: run hard or die. Newspapers remain a profitable business, but circulation continues to decline in every city. Gannett's revolution in newsgathering involves you and me, an idea called crowdsourcing. Once, members of the reporters' club held the keys to the media kingdom. Today you and I are given a ton of space. There seems to be a new level of transparency in that virtually every staffer has a blog for background and additional ruminations. You can find them for columnists, photographers (see SptBlog's links, please) and even the editor, Alan English. * Only 27 percent of young women read a daily newspaper. In Cincinnati, the site cincyMoms.com has brought a mountain of moms to the Gannett paper's web site. Thus the importance of the Redrivermoms site. * Gannett has emerged as the first big publisher to attempt a wholesale reinvention of the newspaper. Rather than clipping jobs, Gannett is shifting staff into new positions and investing in new technologies. * Is Gannett crowdsourcing content in order to cut staff? Wired believes it enables the publisher to expand: more Web pages, more niche publications, more ads. * Some 40 percent of Americans will read one of nearly 1,500 daily newspapers on any given day. The average profit margin at a newspaper in 2006 was about 21 percent — roughly double that of the average Fortune 1000 company. It's a terribly interesting time to be a journalist - or reader. Will sliding circulation be adequately offset by newspapers' web site traffic? How do you charge for web ads? How much change - and emphasis on local news - is enough? Will rabble rouser type material provide enough readership for survival? How do you raise the level of discourse in the Conversation pages? Will the audience accept reporters' videos as a viable medium? Which blogs will make the cut? It's all sort of exciting. None of it seems easy. A Back-to-School Star Party will be held on the rooftop terrace and in the Space Center of Sci-Port Discovery Center this Sunday, Aug12, from 8:15 to10:30 p.m, says Rebecca Prosino. Watching the Perseid Meteor Shower as debris comes from the remnants of the comet 109P/Swift-Tuttle. Visitors can wish upon many falling stars as Earth passes through the tail of this ancient comet. Exploring the Summer Triangle, Jupiter, Delphinus and other celestial bodies and formations. A staff-led Sky Tonight presentation in the SPACE DOME Planetarium. Hands-on activities with Sci-Port’s collection of meteorites. $5 for the public and $3 for Sci-Port members. Open to the public and not limited to school families and educators, will proceed even if there is bad weather. Doors open at 8 p.m.
Arodasi Dance performances are uptown, weird and stimulating experiences. The coming show is called THE green APPLE. 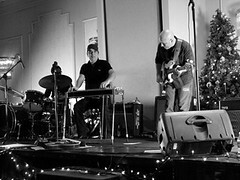 It features live piano improv by guitarist and recording artist Clyde Hargrove III (myspace.com/bandofclyde). On Arodasi company's last go-round, Hargrove's piano style proved dervishizing. Performance begins promptly at 7:15, says Dorothinia, the director. In the performance group are the irrepressible Tim Sample, graceful Lilliana Lara, and a name new to me, Alehandro Baibin. You might consider bringing a camera, for the visual aspects of Arodasi shows are easily the most clavicular in town. Admission has been underwritten by Arodasi. 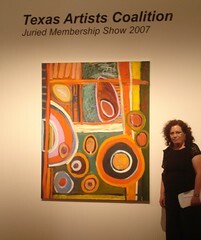 The Texas Artists Coalition Juried Membership Show at the Ft Worth Community Arts Center (the former Modern Museum) includes a piece by Shreveport painter Ellen Soffer. Her new 60" X 48" oil on linen piece is called "Window." The exhibit opened Aug 3. 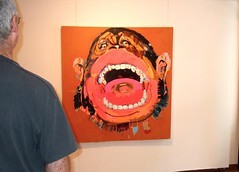 Soffer also has a piece on paper in the McKinney Avenue Contemporary in an exhibit called"War & Peace: Membership Show." How does a Shreveport artist find herself in 2 exhibits in Texas? "Both shows were advertised on their websites," she replied. 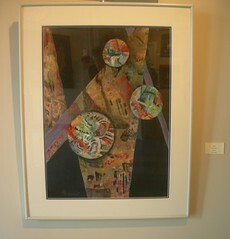 For more of Soffer's winning pieces see ellensoffer.com. Whither Shreveport and its ebbing population? Time for attorneys and professors to offer ideas. From LSUS, an agency that should certainly have a central role in helping cope with population trends, comes a "Conference is Timely Based on Recent Buzz Created by Shreveport Times Article on Population Challenges for the City of Shreveport." Says Neil Erwin, "In hopes of organizing North Louisiana around critical growth management issues centered on land use and real estate development, LSUS will host the First Annual Upstate Louisiana Land Use Planning & Real Estate Development Law Conference on Friday, Aug 24." The conference will feature speakers from throughout Louisiana including Neil Erwin, Shreveport attorney and conference chair, John Good, commercial real estate developer, and Mike Woods, attorney and board member of the Louisiana Recovery Authority. Two LSUS people will also make presentations: Gary Joiner, Ph.D., LSUS assistant professor and director of Red River Regional Studies Center, and Susannah O. Stinson, attorney and associate vice chancellor for University Development. 9:00 a.m. to 5:00 p.m. in the LSUS Technology Center Room 209. $249 per participant or $199 per person for three or more from the same firm/agency. "Wed, Aug 8, on Last Call Carson Daly on NBC, I will be performing with Devin the Dude (Rap-A-Lot Records/Aftermath) as the musical guest," says California-based Shreveport spinner DJ Quickie Mart. "It's my first network TV, internationally televised appearance. Carson's show airs after Conan O'Brian on NBC Late night around 1:30 a.m., so tune in! (It is technically Thursday morning.) Devin's new LP is in stores now." Daniel Lanois is famous for his Grammy-winning production for U2, Bob Dylan and Emmylou Harris. A Canadian, he has also worked with Dashboard Confessional, Ron Sexsmith and many other groups. Lanois is also a singer songwriter. Some years ago he produced a Neville Brothers album and for a time recorded and produced records from a house in uptown New Orleans. There he developed a friendship with Brian Blade, a drummer from Shreveport who was performing with Ellis Marsalis. The intervening years have seen Lanois and Blade work on albums and on soundtracks, such as Sling Blade. In September Lanois will release a film, Here Is What Is, about the beauty of creation. It will debut at the Toronto Film Festival. Not only will it feature Brian Blade's drumming and commentary, it will present Blade's father, the renowned Rev Brady Blade of Zion Baptist Church. Playing on some of the sessions will be Shawn Stroope, Shreveport bassist. There are 2 trailers for Here Is What Is. One features a huge drum riff from Blade and one features singing by Rev. Brady Blade. Because of the stature of Lanois and the Blades, expect the musical world to stop for a moment when this film debuts. Hip musicians and celebs will gaze down upon Shreveport. "Join The Robinson Film Center for a one night-only presentation of the acclaimed independent feature film Once. Winner of the 2007 Sundance Film Festival Audience Award, this modern-day twist on the musical genre has become one of the most critically-acclaimed films of 2007. This is the only theatrical screening of Once planned in our region," says Chris Jay. Tickets may be purchased outside of the theater immediately prior to the film or in advance by calling (318) 424-9090. Advance ticket purchase is recommended, as recent screenings in this series have sold out. This Tuesday night (as always on Tuesday evenings) there will be a cash bar and am awesome jazz duo for your shopping relaxation. Awesome fresh food and good company and original arts and crafts; a lovely way to spend a Tuesday evening! Mitch Landrieu wants to turn beats into gold. He has taken on the mind-twisting task of trying to make a clean dollar from Louisiana's dirty music, food and other artistic voodoo. 1. Rebuild Louisiana to worldwide preeminence as a top tourist destination. 2. Make Louisiana's Cultural Economy the engine of economic and social rebirth. 3. Build better lives and livelihoods than before for all Louisiana's people. 4. Make Louisiana's recovery the standard for high performance, accountability, and ethical behavior. Jazz, zydeco, Cajun musics, Carnival, Creole cooking. It is evident that Louisianians possess magical gifts. If only someone could make it pay off widely. Landrieu cannot do it by himself. But the framework he's developed might help people like Panderina Soumas, a woman parlaying her Creole cooking talent into a revenue stream. Landrieu will speak at Artspace, Wed, Aug 15, at 4:30 pm. There will be a press conference during which he pushes his World Cultural Economic Forum. At 5:15, says Stacie Leng, he will take a Trolley tour of Shreveport cultural sites. 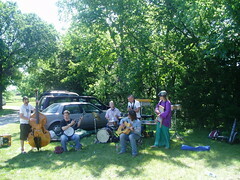 Artspace will have music by the hard-traveling Bluebirds. The Flett brothers, Buddy and Bruce, are exemplars of how to use cultural gifts. 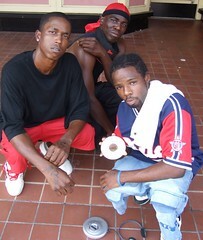 Possessors of the bayou blues tradition, they have worked like miners to make it pay off. If you're part of the Bayou State cultural scene, you're used to doing it on your own. Today, someone's trying to help multiply your effort. 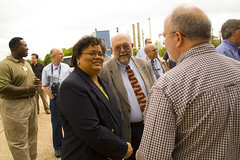 See the Lt Governor / Dept of Culture, Recreation & Tourism / La Rebirth site. You may be surprised at the level of organization and incubation expressed therein. 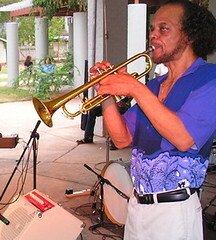 "The Jeff and Vida Band is one of New Orleans best known acoustic roots acts," says the spin at Jeffandvida.com. "Performing original material spanning from Appalachian bluegrass to alternative country. Their live performances showcase Vida’s powerful voice, Jeff’s superb picking on mandolin, guitar and banjo, Mike Kerwin’s slap-you-in-the-face bass playing and tight well arranged harmonies." Dial up their tight harmonies and whisky-whoop at their myspace.com/jeffandvida site. Jeff and the comely Vida come to Spt at 7 pm, Sat, Aug 11, via the Bossier Arts Council & Red River Radio, says Candy Peavy. 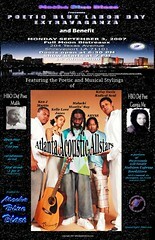 The House Concert Series is produced by the HCS Volunteer Committee and Fairfield Studios. Bossier Arts Council's East Bank Gallery is the site for the latest show by the West Edge Artists' Co-op, says Danielle Reans. The West Edgers had a Milam St gallery for almost a year. They recently closed that gallery. The group is creating events (presenting a lecture by Neil Johnson last month) and showing art in venues (like Bistro 6301) across the region. The opening reception is Mon, Aug 6, 6:30 pm. East Bank Gallery hours are M - F, 9 to 5. War Made Easy examines a 50-year pattern of government and media spin that has dragged the US into wars from Vietnam to Iraq, says Norman Solomon. Narrated by actor and activist Sean Penn, the film presents archival footage of presidents from LBJ to George W. Bush. The American news media have uncritically disseminated the pro-war messages of successive presidential administrations, asserts Solomon. War Made Easy follows parallels between the Vietnam war and the war in Iraq. Guided by media critic Norman Solomon’s research and analysis, the film presents examples of propaganda and media complicity from the present alongside leading journalists from the past, including Lyndon Johnson, Richard Nixon, Defense Secretary Robert McNamara, dissident Senator Wayne Morse, and news correspondents Walter Cronkite and Morley Safer. "It was about 8:50 pm, the last night of Mudbug Madness, 2007," writes painter-photographer Tony Reans, who owns and is learning to use a gigantic, archaic instrument called a view camera. "For those of you who aren't from here, it's an annual festival where locals eat boiled crawfish and drink beer. I know, who would have thought Southerners did stuff like that? Here my wife, Danielle, and I come, walking through the crowds, carrying a tripod and a backpack full of camera equipment. It was hot and humid, and the place was crawling with our fellow North Louisianians, drenched in their own sweat and the smell of mudbugs. I decided the bridge (on Spring Street) over the train tracks was the best location to capture the moment. The cop standing on that bridge didn't agree. He felt we would block pedestrian traffic with our tripod. He told me as much before I set it up. I told him we'd only be a minute, and promised not to endanger anyone, so he let us set up, with a warning to, 'Make it quick.' Nice guy. That's not the funny part. Danielle thought we were going to be arrested at any moment. I had to hold back giggles as I set up the tripod, got the camera out, set it up, got the lens out and attached it, got the film, film holder and light meter out, took aim, focused, checked the lighting, and ran through all the motions, just getting ready to make the photograph. She was sweating and glancing over her shoulder at the mean-eyed policeman. That was the funny part. I comforted her with words like, 'Oh forget that jerk. What's he gonna do, arrest us for being artists?' She didn't laugh. When I was happy with my composition, I clicked the shutter release, and waited about 22 seconds before closing the shutter, finishing the shot. Done. Then we had merely to break everything down, pack it up, and walk past the friendly man in blue. I called out, 'Thank you, officer. Have a good night!' He grumbled something and Danielle sighed and mumbled something to me about shutting up. She sort of grimaced at him. Wow, that's really a wild life we live, huh? We almost got griped at by a cop. Dangerous stuff. It really was fun, though." Terry Gill, the Captain for the Krewe of Highland for 07 - 08, says, "Well, it's that time of year again. Mardi Gras Season is in full swing with coronations and parties leading up to the big blast. So, we are having a general meeting and membership drive Monday, Aug 6, at 6 pm at Columbia Cafe. Please join us and sign up for another year of fun. Bring your wallets. There will be a cash bar. And we'll have plenty of membership forms in case you want to sign up on the spot. Bring any friends who might be interested in joining. Also, if you know someone who has been a member, but who may not have an e-mail address, tell them. I look forward to seeing you there." It is always a pleasure to get a reminder of What They Eat in the Atchafalaya Basin. Especially from someone with a 900 mm lens and decades of experience in lighting and composition. This catch is from one of the best: author-artist-photog Neil Johnson. Once the Atchafalaya brought a full smile to our faces. It was, like, crawfish and catfish, gators and crusty Cajun trapper-fishermen. The greatest riverine basin in America. Today we are aware of the loss of this marsh to saltwater incursion. We are aware that tampering with the Mississippi's outlet route - the Atchafalaya is one of those - is part of the problem that faces New Orleanians and people from Barataria Bay to Lake Charles. The swamp has turned problematic and complex. The Atchafalaya is something like the last half of a bowl of gumbo on a cold day. All of a sudden you're not simply filling the belly; you're going to savor it. Get your children to taste it. Talk about it between spoonfuls. When was the last time we visited the Atchafalaya? The NY Times' Andrew Park checks in with New Orleans scatty cultural economy in an article entitled "The Katrina Effect, Measured in Gigs." Life is none too healthy for Crescent City musicians, reports Parks. Gigs are soft and many musicians are having trouble returning to the Crescent City. One of the bright spots is Tipitina's Foundation. That's where Roland and Mary von Kurnatowski, founders of the foundation, move the profits from the nightclub to the musicians' aid society. At the Tipitina's Music Office Co-ops, operating in New Orleans, Alexandria and Shreveport, players have cheap access to computers and aid from savvy office managers - like Dan Garner, in Shreveport. They build web sites and find out how to use the web in general. They record and collaborate on their neighbors' recordings. They edit video and design posters. Tipitina's Foundation has donated some $1.5 million to musicians in the wake of Katrina. It has provided attorneys a place to help musicians in a pro bono effort. But, says Park, Louisiana's efforts to restart the music business in a larger way have been mixed. The NY Times says, "Lt. Gov. Mitch Landrieu unveiled a new strategy for developing what was described as the “cultural economy.” Since then, the state has pushed through tax breaks for arts districts, musical and theatrical productions and sound recordings and made sure that events like Mardi Gras and Jazz Fest, which provide work for many musicians, survived. But a separate individual tax break for artistic earnings failed in the State Legislature because of concerns that it wasn’t fair to other working people, and other large-scale attempts have languished because of a lack of financing." Landrieu will visit Minden and Shreveport on Aug 24 to talk about his vision for Louisiana’s economy through culture, recreation and tourism, says the Lieutenant Governor's web site. Musicians, artists and culture mavens will certainly want to see whether an effective coalition might be formed around his efforts.